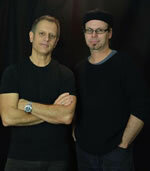 Convergence is a recent project from Dave Weckl and Jay Oliver. Jay was a major creative force behind Dave's first three solo releases and two Dave Weckl Band records (Rhythm of the Soul and Synergy). Convergence reunites these longtime musical counterparts with 10 new songs. Highlights of the album include a remake of Stevie Wonder's "Higher Ground," a nod to 1990's "Master Plan" which featured two drummers. This time, it's Dave, the incredible Chris Coleman, a first-call horn section, three gospel singers, and legendary players including Dean Brown (guitar) and Jimmy Johnson (bass). Convergence also features a collaboration with Bill Whelan (Riverdance) that was partially recorded in Ireland, a saucy New Orleans-insprired tune, two jazz tunes, two "fusion" tunes, and two solo pieces (drums and keys). Additionally, play along versions of each song are available (below) along with a full-length movie on the making of this album (also below). 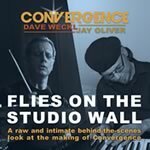 Flies On The Studio Wall is the companion movie to the 2014 Convergence CD from Dave Weckl and Jay Oliver! It is available on Blu Ray (HD) and DVD in widescreen NTSC format and features more than two hours of footage! As the name implies, Flies puts you in the middle of this recording proejct. Watch Dave and Jay as they rehearse and record each of the album's 10 songs. You get to see sessions with Mike Stern, Tom Kennedy, Gary Meek, Chris Coleman, and more! Dave's solos are captured from multiple angles. Spend a full day with the crew at Sunset Sound during the recording of "Higher Ground!" Then, join Jay on his journey to Ireland where he joined Bill Whelan (Riverdance) to record some of Ireland's best musicians. The film includes a comprehensive look at Dave's studio and gear, plus a section on Dave and Jay's formative years. FFilmed mostly with handy cams, Flies On The Studio Wall is raw and revealing. Total running time: 2:08. It's your turn to sit in on Convergence! The DVD data disc includes everything you need to master these songs! The disc includes play along mixes (click and no click), charts, and multicamera HD videos of Dave's actual sessions on a data DVD (mp4 format)! Includes a bonus video of "Hand It Over," which shows Dave playing all three parts of the song! Album and play alongs for other instruments sold separately. Download all parts directly to your computer. HD videos of Dave's sessions. The CD data disc includes everything you need to master these songs! The disc includes play along mixes (click and no click) and charts. Drum play along and full album sold separately. 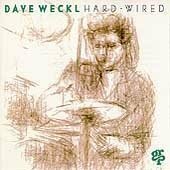 Before forming the Dave Weckl Band in 1997, Dave released three records on the GRP label. These records are still available from many Internet retailers, and feature many great jazz artists. "Hard-Wired" was the last of the GRP-era recordings. Released in 1994, Jay Oliver (keyboards) and Dave had a lot of fun making this record. Still at a place where they were writing with no consideration to for a band, there were no boundaries. As with all of Dave's recordings, there is a diverse array of material and styles on this record. One of Dave's favorite bass players, Anthony Jackson, plays on most of this CD, with James Genus and John Patitucci also making appearances. And...check out the final track on the record - Jay Oliver's soulful tune, "Tribute." "Heads-Up" was the 1992 follow up recording to "Master Plan. A lot had changed for Dave, as he had recently moved to California. This record was the first recording completed in his home studio. 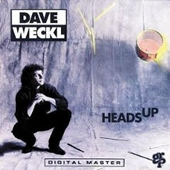 Like all the GRP-era recordings, "Heads Up" was a "project record," with no band concept in mind. Jay Oliver and Dave used the computer quite a bit for composition and production, and most of the bass on this record was programmed. However, Jimmy Earl made an appearance on a few tunes, as well as Gary Novak (the drummer!) also playing bass on a tune Dave co-wrote with him! 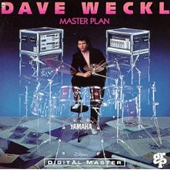 Dave's debut album for GRP Records made a big impact and is a classic among drummers and jazz fans worldwide. Produced in 1990, Jay Oliver and Dave took their original ideas from the instructional package, "Contemporary Drummer + One," where they used the computer to compose (with Performer). With Jay's exceptional programming skills, they had a "band in a box" pretty easily. Dave added his parts to the sequences, then overdubbed other guests for most of the songs. And those guests were substantial, including: Chick Corea, Michael Brecker, Anthony Jackson, Steve Gadd (performing a duet with Dave on a Chick song), Tom Kennedy, pianist Ray Kennedy, and guitarist Peter Mayer. They did it all in Jay's basement (except for the title track with Gadd), on a TAC Scorpion board using LOTS of compression!